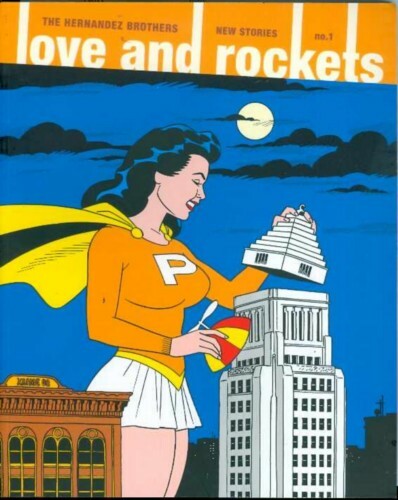 Love & Rockets: New Stories #1 reboots the beloved ongoing Love & Rockets comic into a fat, annual graphic novel-length package! Jaime launches the new format with a story that's unusual even for him - a full-on, pulse-pounding super-hero yarn! Maggie's longtime friend Penny Century has finally realized her longtime dream of acquiring super-powers, but at a terrible personal cost. Now she rampages through the galaxy, half mad with grief, and a motley group of super-heroes assembles to try to stop her - led by Maggie's girlfriend Angel and her mysterious neighbor Alarma, and involving a number of characters longtime Love and Rockets fans will delight in recognizing. The epic-length 50-page story (only the first half of the saga!) combines Jaime's razor sharp characterization and superlative art with wildly inventive, Kirby-style slam-bang super-hero action. Then Gilbert Hernandez explodes with a similarly generous helping of his fantastically creative one-shot short stories: "Tamanny" (rookie cop vs. demonic drug users); "Papa" (a turn-of-the-century story involving a traveling businessman); "The New Adventures of Duke and Sammy" (super-powered Martin and Lewis impostors in outer space); "The Tender Room" (Into the Wild as re-imagined by Beto); "Chiro el Indio" (written by third brother Mario Hernandez); and "Never Say Never" (a kangaroo gets lucky in Las Vegas). One hundred pages of Jaime, Gilbert and Mario Hernandez at the peak of their powers!